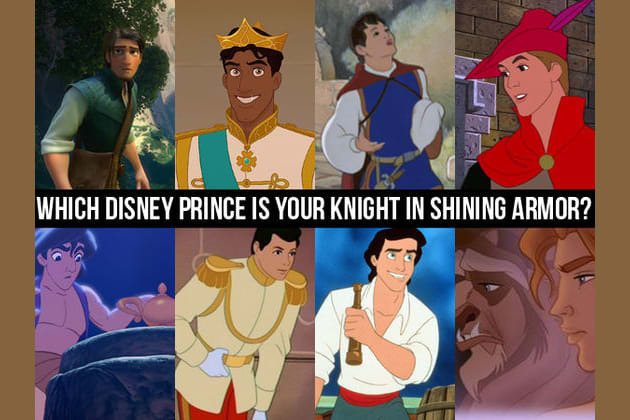 Which Disney Prince Is Your Knight In Shining Armor? What trait do you look for in a significant other? Which song from Taylor Swift's 1989 describes you the best? Which 1D guy are you currently crushing on? Your knight in shining armor is Prince Philip! The Sleeping Beauty prince's sensitivity and athleticism make him your perfect match. Get ready for a lot of romantic dates on horseback! Tangled's Flynn Rider has won your heart. You're looking for a guy with humor and confidence and Flynn has both in spades! Plus he can pull of The Smolder like no other, and you can definitely look past the fact that his real name is Eugene Fitzherbert. Adam, or the Beast as he's commonly known, has found his new Belle! You like a guy with some mystery to him. Adam is a bit hard to figure out, but you love a good challenge so that's part of the fun for you. Prince Eric of The Little Mermaid fame is definitely the prince for you! You're a sucker for guys with beautiful eyes that you can get lost in. Plus, the adventure seeker in you would love that the two of you can sail around the world on his ship. Prince Naveen has danced his way into your heart. The Princess and the Frog prince is perfect for you because he loves music nearly as much as you do. He'd make the perfect concert-going and music-making partner! Snow White certainly has some competition when it comes to her Prince Charming. He may be shy, but his sense of adventure and ability to rock a cape definitely spark your interest. Your love was meant to be! Aladdin doesn't just steal bread, he steals hearts too and he's totally stolen yours! You're super into the sensitive yet rebellious type... especially the ones who can take you on flying magic carpet rides. Cinderella's Prince Charming would completely fall for you! He's got that classic style, which you love, and he's never gives up on his dreams. Is there anything more romantic than a guy determined to find his true love? Disney princes have a reputation for being handsome, kind and brave- but which prince is right for you? Answer a few simple questions to find your answer!